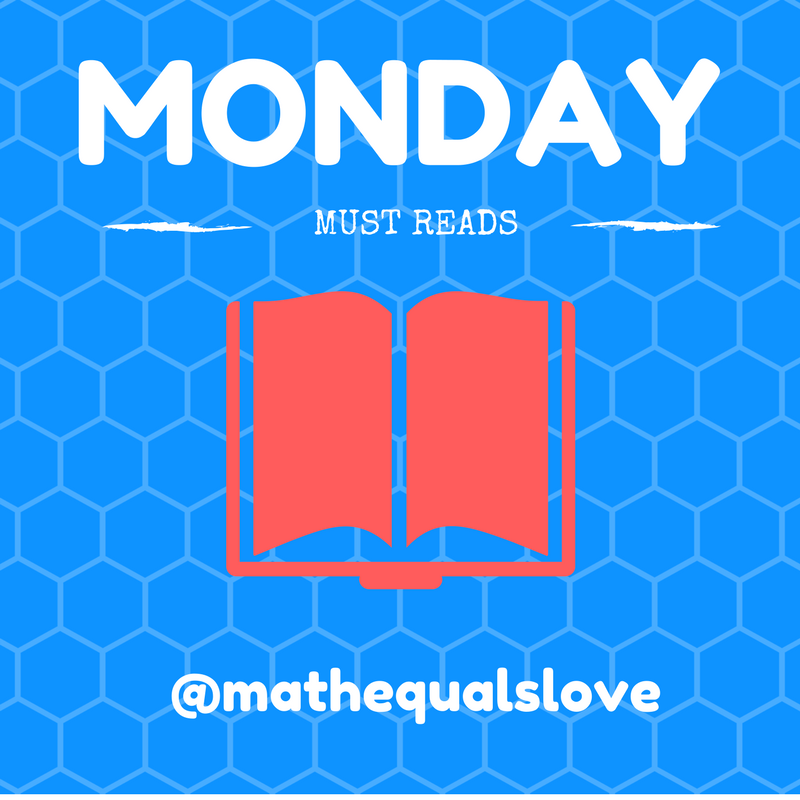 It's hard to believe it's already time for another Monday Must Reads! Hope all of my U.S. friends are having a lovely day off for Labor Day. No matter where you are located, I hope you find an inspiring idea to use in your classroom! Kay Kubena's twitter account is full of hands-on activities for collecting statistics data. If you teach AP stats (or non-AP stats! ), her account is a must-see. I'm not teaching stats this year, but my husband is. So, I'm still on the lookout for fun stats activities. Does the name brand Lucky Charms have significantly more marshmallows than the Wal-mart brand? I kinda want to buy two boxes to find out for myself! Adrianne Burns has an awesome classroom display about what mathematicians do. The conversation it sparked with her child is PRICELESS. 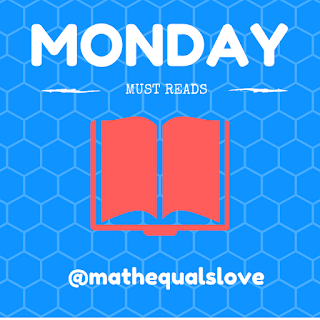 All students need to know that making mistakes is part of being a mathematician! FCMathLab shares a new-to-me collaboration task for the first week of school: the tennis ball transfer activity. This looks super fun! I love that students are given a bunch of options of materials to use. Amanda Thom shares a great activity for teaching logic in geometry courses that involves looking at real-world advertisements. I especially love the Walgreens one! I absolutely love the questions that Damion Beth poses to his students on the first day of school. Looking for a way to organize groups in your classroom? FCMathLab shares a photo from Mr. Guadagni's classroom of group clipboards and role lanyards. Brilliant! I love finding ways to have students experience things for themselves instead of just reading about it or listening to me talk about it. There's no way that I can have my chemistry students re-enact Rutherford's Gold Foil Experiment, but I think we can fit in some time for atomic bowling! Thanks Mrs. Geyer's Class for sharing! Looking for a fun data collection idea? And maybe a yummy one, too? Julie Steiner suggests stacking oreos. I love how Jackie Stone helped a geometry problem come alive in her classroom by posting points around the room that corresponded with a problem they were solving. Jazmine Castanon created a beautiful growth mindset display in her classroom using Famous Failures. I think this would be beneficial for every classroom. I love that students read about the failure first then lift the flap to reveal the success the person later became! Ms. Molley had her students create their own categories to classify shapes as an introduction to geometry before looking at the classifications found in the book. Liz Mastalio's students created life plans in Advisory. I think this is an awesome way to get students thinking about the future. I also see great potential in this activity for working with percents! Destinee Johnson gave her students some Harvey related Dimensional Analysis questions to get them thinking about how they can help the victims. Teaching geometric sequences? Have students model the impact of a chain letter like Randy Revels, Jr. did! I can't wait to do this when we get to sequences in Algebra 1 this year. I love this quote shared by Jen Hornsby Beach. This needs to make an appearance in my classroom! Sue Runge tapes growth mindset statements to each students' desk. I love the atmosphere this creates! Julie Morgan shares a great activity for practicing factoring - the Common Factor Clock. Four Fours is one of my favorite activities to do with students. So, I was super excited to see this bulletin board created by Paul Smith! I love how this recognizes multiple solutions. Math jokes are kinda my thing. I was super excited to find this new math joke from Kacey Norojo. You're welcome! Twitter moves so fast that it's super easy to miss stuff. I like compiling these posts because it helps me come back and find stuff later!